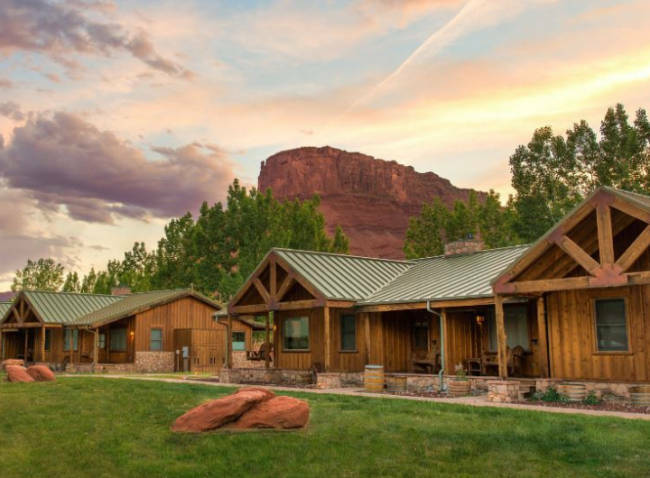 The Sorrel River Ranch Resort & Spa is a stunning, four-diamond resort with easy access to both Arches National Park and Canyonlands National Park. 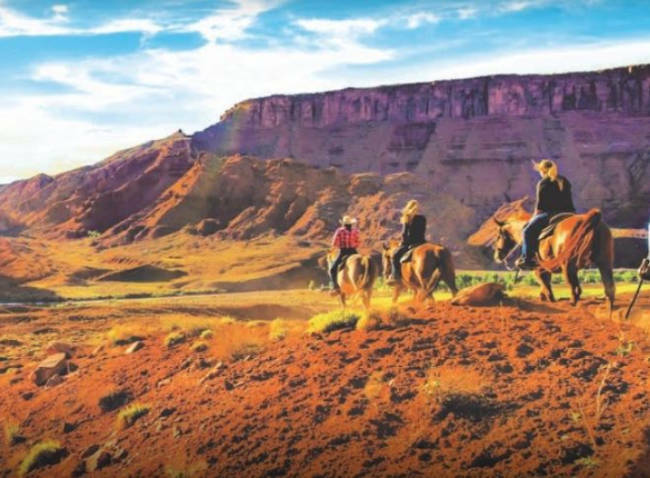 Located just 20 miles northeast of Moab, Utah, the 160-acre resort pairs traditional ranch hospitality with luxurious accommodations. 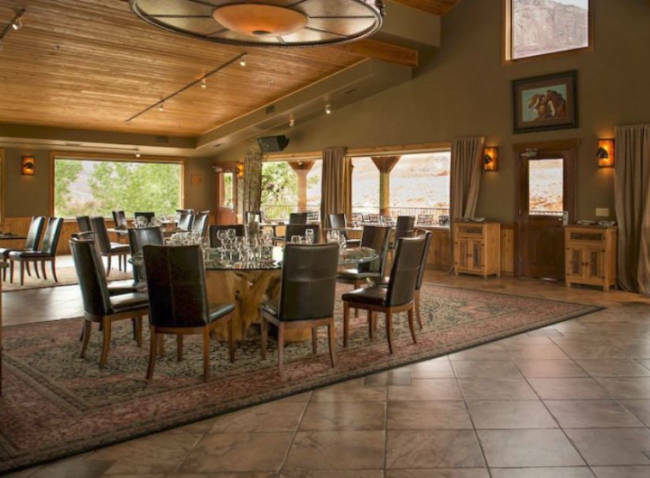 The resort has a farms market restaurant called the River Grill that serves up locally sourced, seasonal fare. There is also a bar, fitness center and a plethora of recreational activities that cater to couples, families, and large groups. Kids enjoy the petting zoo, lawn games, swimming, pony rides and s'mores. 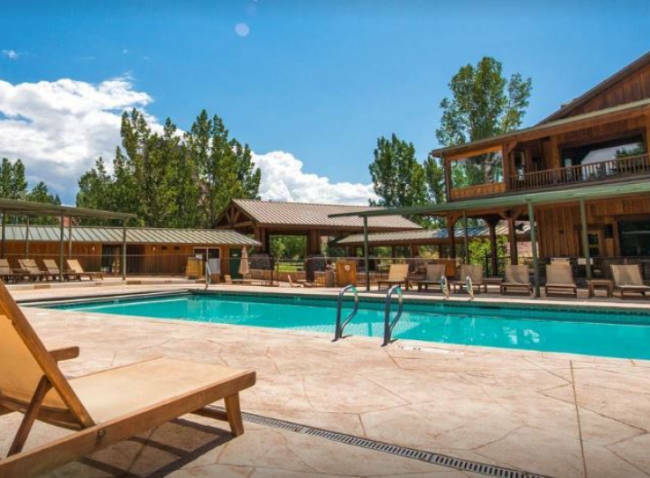 Adults enjoy the spa, tennis, horseback riding, hot tub and more. The resort has the perfect combination of activities to keep everyone entertained. 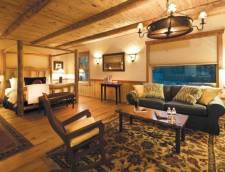 The resort has 59 guestrooms including studios, suites, and a private ranch estate. 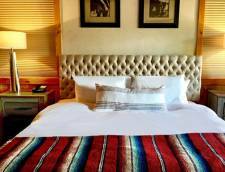 All of the rooms come with a host of western pleasantries like television, internet, comfortable bedding, plush terry cloth bathrobes and more. 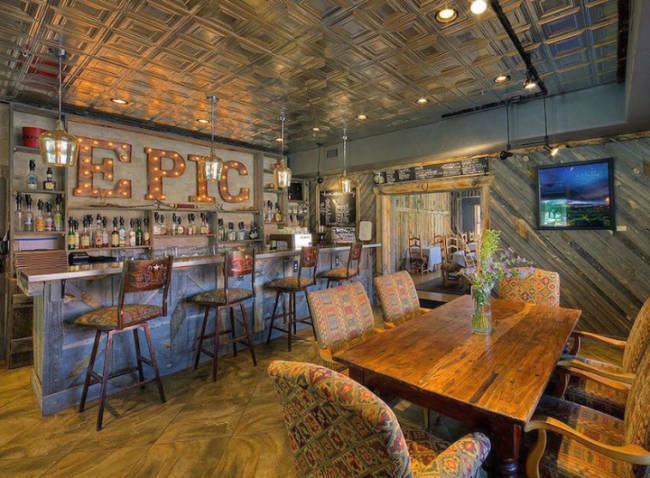 In addition to the many upscale room amenities, guests are also treated to complimentary morning coffee to go at Epic Bar, bottled water and light refreshments, daily guided hikes and evening campfires with s'mores. The history of the ranch dates back to 1903 when homesteaders Fred and Ida Sterns claimed the untamed territory that is now the resort. Their original two-room farmhouse still stands on the property to this day. The farm was later sold to Bill and Lillian Boulden in 1947 who continued the farming tradition for almost 50 years before selling the property to Robbie Levin, the former bass guitarist for Rick Springfield, in 1994. Levin then developed the Sorrel River Ranch Resort and Spa which officially opened in 1999. 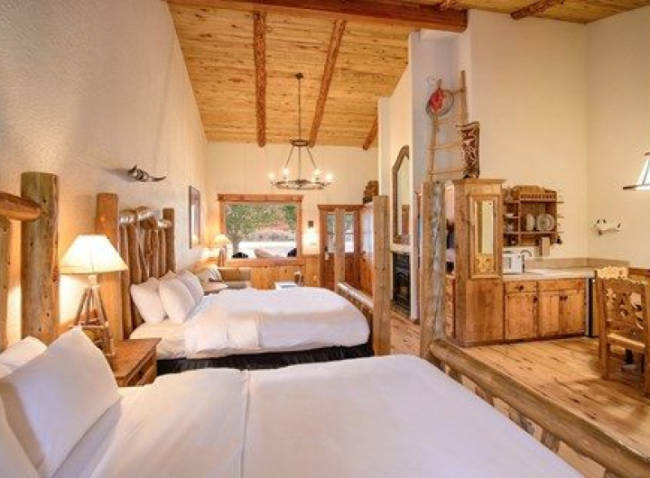 The Mesa Studio King rooms are 400 square feet and sleep two in a king bed. 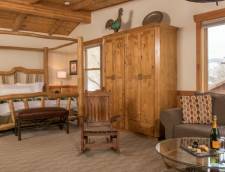 Decorated with handcrafted, rustic furnishings, the room features a kitchenette, dining area, and private bathroom with a tub/shower combo. The studio also has a porch swing to take in the sweeping views of the Mesa. 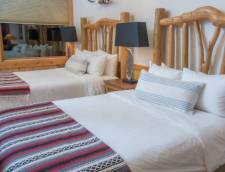 The Mesa Studio Double rooms sleep four people and have two queen beds. 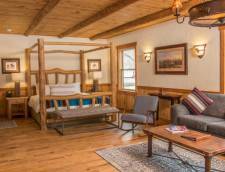 Donned in rustic ranch motif, the room has a small kitchenette, dining area, and private bathroom. There is porch seating outdoors for guests to take in the stunning, sweeping views of the desert. 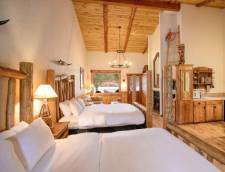 The River Studio King rooms are larger than the mesa rooms and also offer stunning views of the Colorado River. The room sleeps two and has a king bed, dining area, and kitchenette. In addition, the river rooms also have a sitting area and fireplace. The studio has a spacious bathroom with a jetted claw-foot tub and a separate glass shower. There is also a private deck with patio seating to enjoy the view. This river view studio is named after the homesteader Fred Stearns, who in 1903 claimed the untamed territory which is now the resort. The Fred studio features a queen bed and sleeps two people. The cozy room is 360 square feet but doesn't skimp on the luxury and still includes a sitting area, dining table, kitchenette, and a private bathroom with a tub/shower combination. The room has a porch with patio seating to take in the river view. 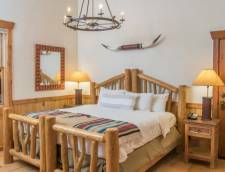 Outfitted in custom, rustic decor, the River Studio Double rooms have two queen beds, a dining area, and a kitchenette. The room sleeps four people and with the extra space also includes a living area, fireplace and a generous bathroom with a jetted claw-foot tub and an oversized glass shower. 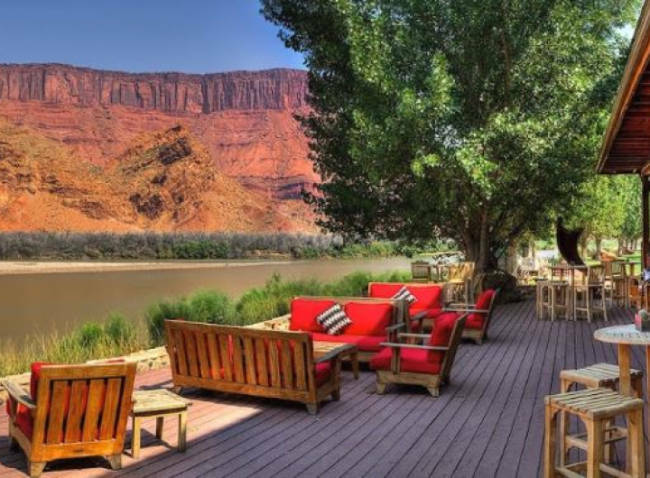 From the living area or private deck, these rooms offer stunning views of the Colorado River. 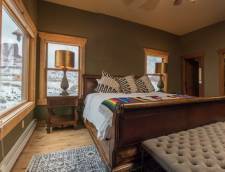 Named after homesteader Ida Sterns, the Ida studio features two queens and sleeps four guests. The studio has a private bathroom, sitting area, small dining table and a kitchenette. There is a porch swing outside for guests to take in the breathtaking river views. The Balcony Studio is one of the most romantic rooms at the resort making it a perfect selection for couples. 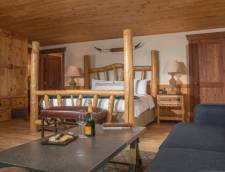 The spacious studio features a king bed and a private bathroom with a jetted claw-foot tub and a separate glass shower. There is a sitting area with a sofa sleeper, a dining room and a kitchenette complete with microwave, small fridge and coffee maker. 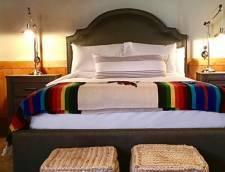 The room has a private balcony with a stunning view of the Colorado River. The Mesa Suite is a great option for small families wanting a little more room and privacy. 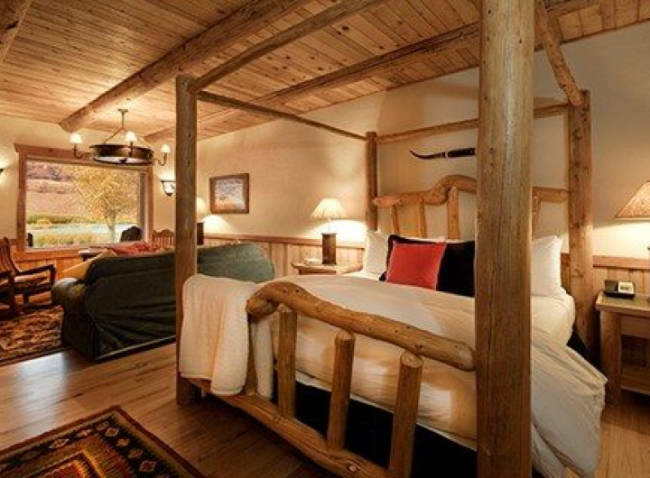 The stand-alone suite sleeps four guests with a queen in the bedroom and a sofa sleeper in the living room. The suite also comes equipped with a private bathroom, dining area and a kitchenette complete with stove, Mini Refrigerator, microwave and coffee maker. The suite has a porch with a swing and patio seating. The Mesa Family Suites are two-story units that sleep up to six people. Families and groups traveling together love to book these suites because they have two separate sleeping areas. There is a king and a private bathroom on the lower level and two queens and a second full bath on the second floor. The suites also have a living room, dining area, and a kitchenette. There is a swing and patio seating on the porch for guests to enjoy the great mountain views. 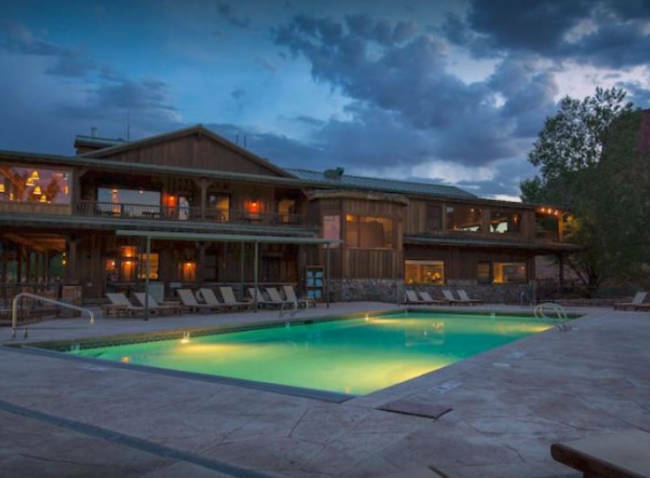 The River Family Suites are the exact same layout as the Mesa Family Suites on the property, however these suites have incredible views of the Colorado River. 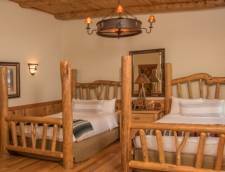 Outfitted in custom, rustic furnishings, these two-story units accommodate up to six people and are ideal for families or groups traveling together. The lower floor has a sleeping area with a king bed while the second floor of the suite has two queens. In addition, the suites all have a living room, dining area, kitchenette and two full bathrooms, one on each level. These units have a porch swing and chairs to appreciate the incredible views of the Colorado River. 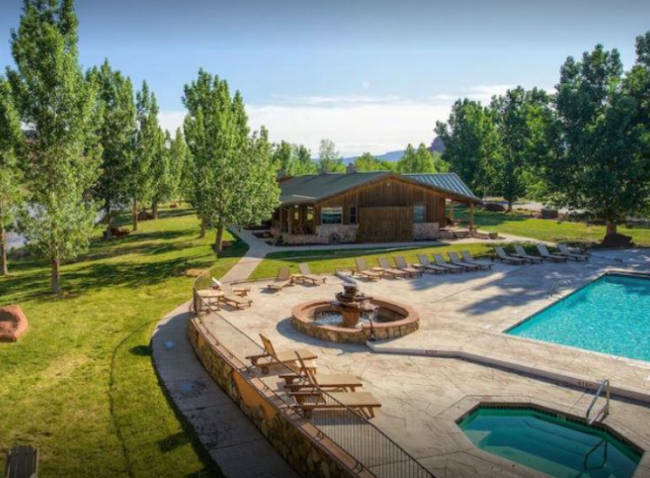 The Ranch House Estate can accommodate 14 people and is comprised of a four bedroom ranch house and a two bedroom guest cottage. The two units are decorated with custom furnishings and boast luxurious amenities. Each of the six bedrooms have a private bathroom with the master bath featuring a jetted tub and stand-alone shower. In the ranch house there are three queens and a king and in the guest cottage there is a king and a queen. The living room has leather sofas, a fireplace, and a large screen television. The home comes equipped with a full kitchen, indoor sauna, dining area and washer and dryer. The property has an outdoor gas grill, private deck with hot tub and garage parking. The beautiful estate is located across the street from the main property and offers discerning guests privacy as well as incredible views of Castle Valley. An amount equal to one-night is required at the time of booking as a deposit. A mandatory daily resort fee of 12% will be added to the nightly rate. Cancellations may be made 45 days prior to arrival will incur a one (1) night room, tax and resort fee cancellation fee. Cancellations made less than 45 days prior to arrival will be subject to a 100% penalty. No refunds will be given to no-shows. Dogs allowed with $100 per reservation pet fee plus tax. $75 plus tax for rollaway, cribs no charge. Two night minimum March through October. A 12% Resort Fee will be added to the total.